This homemade costume for men entered our 2013 Halloween Costume Contest, and won 2nd place in the Coolest Adult Costume nomination! When I first saw the real "Mirror Man" on google, I was astounded. It truly is amazing. So I decided a few months before Halloween, that was what I wanted to do. 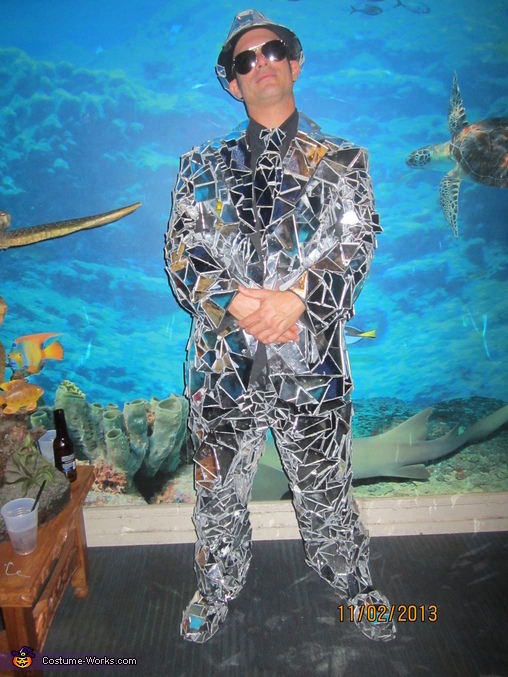 I used sheets of mirror I purchased, cut into pieces with a dremel, edges sanded down for safety purposes, glued onto a suit from the thrift store. It took 3 of us 6 weeks to make it, all working diligently. The reactions were well worth the effort put into the costume. Astonishment, amazement, so many people saying it was the best costume they'd ever seen. I'm not saying it's the best costume anyone has ever seen, but I got that reaction a lot. It was so much fun. About $600 in material went into the suit altogether, and I paid 2 friends $100 each to help me. So $800 total cost. Plus some pieces come off every time I wear it, so additional mirrors and glue every time its worn. And as I said it took 3 people 6 weeks to make it. So it was quite an expensive and time-consuming project. I had no idea, going into it, how much it would cost or how long it would take. By the time I had even CONSIDERED the option of "abandoning ship", the suit was already half done... and half the money already spent on materials, so there was no turning back once I was into the project. The pictures really dont do the costume justice, as you cant see the lights reflecting off the mirors. Whatever color the lights around me are, the suit positively glows in that color. We were in a club at one point, and the lights that move around the room and stop every so often.... stopped right next to me. I stepped into the light that was shining on the floor, and the whole club lit up with reflections, and I turned around in a slow circle like a human mirror ball. Starting in 1998, I built a Mirror Man outfit for Burning Man and have evolved it ever since. My philosophy as Mirror Man is that I'm a reflection of everyone and thing around me. Because the mirror tiles kept falling off I evolved to using stailess steel discs sewn to my coveralls but also still use some Kit Kat mirrors. I tried the flexible carnival mirror sheets but it is impossible to work with that stuff. Very cool Mike! I'd love to see it. Do you have pictures anywhere online?